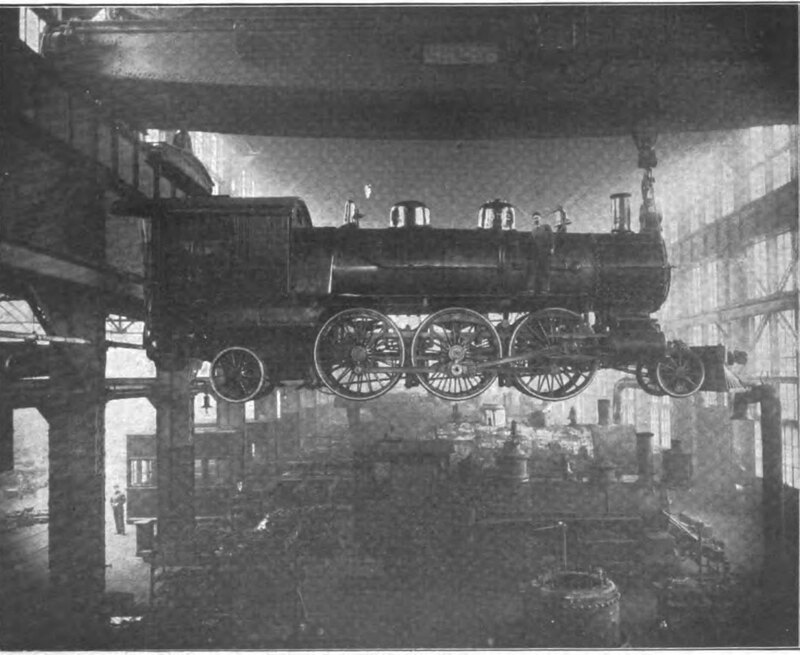 Lifting a Large Locomotive into Mid-Air. Ohio Illustrated Magazine, Dec, 1906. 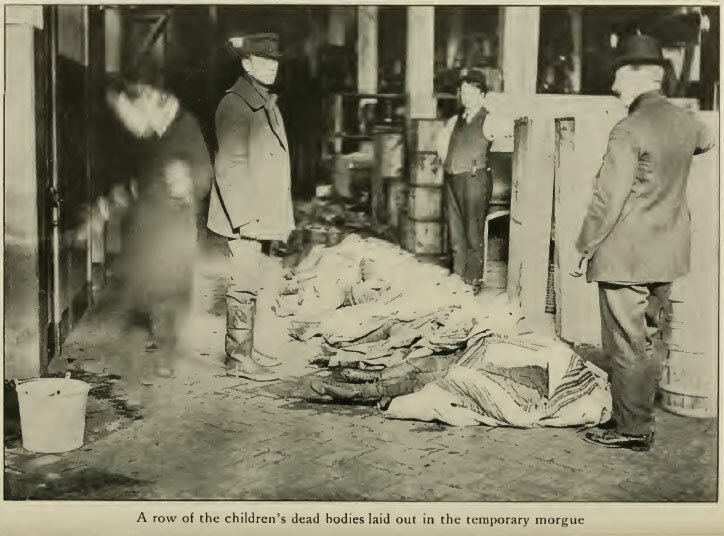 Parents in the Morgue Identifying Bodies. Marshall Everett, Complete Story, 1908. 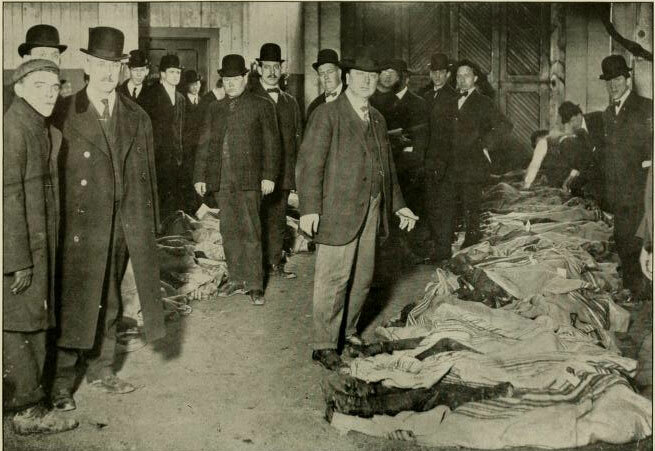 Only men appear in this image, though newspapers frequently reported on mothers searching for their children’s bodies. Many publications marveled at the innovation, efficiency, and scale of the Collinwood railyard. 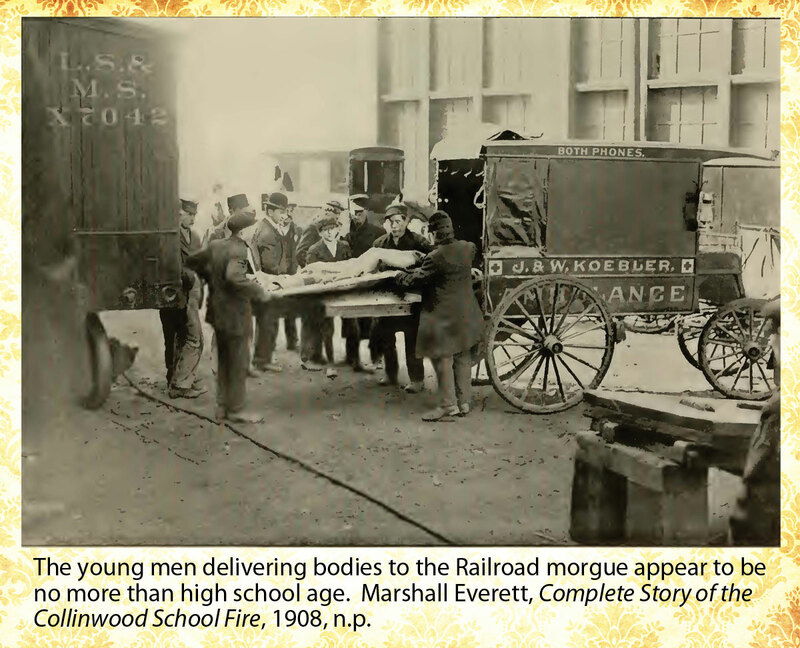 In the The Ohio Illustrated Magazine, the “tremendous activities” in the Lake Shore’s maintenanceManagers transformed a cavernous warehouse into a morgue, a clearing-house for elementary schoolers’ charred remains. facility overwhelmed W. Frank McClure, who spent most of his career promoting the wonders of modern financial institutions and massive industrial enterprises: “Picking up locomotives of 240,000 pounds, swinging them through the air like so many toys, and finally depositing them two hundred feet away is an everyday occurrence at the Collinwood, Ohio shops.” McClure watched workers fit 80-inch wheels onto locomotive axles and even admired the smooth flow of paperwork through management’s offices. Everything at the facility was organized, he wrote, to “the best possible advantage” (Dec 1906). Injury and death haunted workers at the Collinwood railyard, but celebrants of technological advancement saw only the perfect expression of industrial efficiency. Everyone in Collinwood was used to the vicious wounding of railroad workers, but the onslaught of 172 burnt children’s bodies and the influx of disaster tourists pressed devastating questions about the brutality of the world Curiosity Draws Great Crowd. People Stand for Hours in Front of City Hall Where Dead Bodies Were Taken. CN, Mar 6. 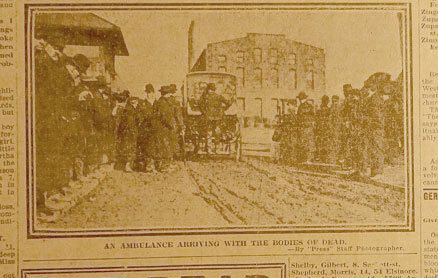 Bodies not identified after two days were moved from the Lake Shore’s warehouse to Collinwood’s town hall. 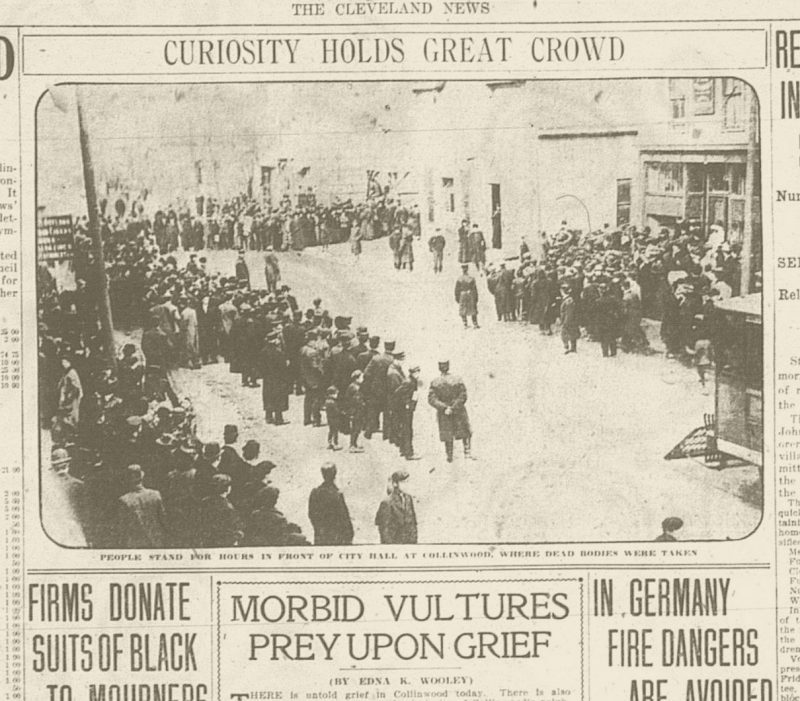 The News called the throngs “morbid vultures.” that the people of the town inhabited. Leonard Buschman worked the nightshift at the railroad’s maintenance shops. Asleep at home when the fire started, he rushed to the school too late to save his two daughters but in time to see dozens of other children die. Afterwards, he searched the morgue—which was also his workplace—in desperation, trying to identify his children’s remains. The next day, newspapers reported that Buschman, “driven violently insane,” tried to kill himself in the street.